What a great past couple of days…We got to Egypt and survived the ride to our hotel. The dinner cruise on the Nile was a great time. Jeanette has already posted about that, so I won’t go into detail, other than to say several people think I was smiling a tad big in the photo of me with the belly dancer. 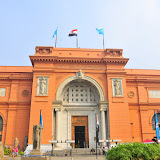 The next morning we went to the Egyptian museum. We happened upon a guide that is also a professor. He guided us through the highlights of the museum (again not allowed to take photos inside) with good explanations and made it enjoyable. He was quite a wheeler and dealer. Everyone knew him at the museum and expected to get some of the gum from his bag. After we finished the tour, we were taken to a papyrus and perfume shop. We bought a few things there (we are sure he got a kick back). But we also arranged for a day tour to the pyramids for today. He had his son drive and they picked us up at our hotel. We went to Memphis and Saqqara first. Seemed like we went back in time somewhat as we saw donkeys pulling carts and what I called an Egyptian Cattle Drive that included a water buffalo. After that we went to Giza to see the big show! We rode a camel to the third pyramid, which is the one we entered. Then it was off to the Sphinx. It was truly amazing. Our guide then took us to our other shopping obligation, which was a bazaar. Jeanette can give more details in her blog. She will be typing tomorrow morning while I am golfing! LOVE LOVE LOVE all the camel, pyramid, and sphinx pictures! Rosalynn asked why you were riding camels so your trip is very educational, even from across the miles. The sphinx is longer than I thought it was. Thanks again and continue having a great time!